Am sure u all must hv wondered after reading my previous post how come I get well so soon and back with this puttu recipe... Nothing guys, I have few recipes waiting to print and moreover today am feeling bit better than those terrible cruel days. So, just to take off the pressure and to switch my concentration I've slowly started finishing out my pending works..Hope u njoy this one.. 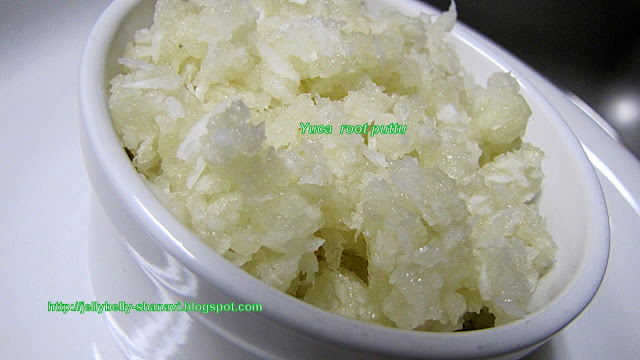 Squeeze out all the juice from the shredded yuca rootand mix it with a pinch of salt.Layer the puttu maker by topping up with little bit of coconut (layer) followed by the layer of yuca root and again a layer of coconut to finish it off. Steam this mixture for 10minutes and have it with sugar . Not to worry if u don have puttu maker, place the squeezed shredded yuca root on a moist cloth and tie the ends together. Steam it for 10 minutes and untie the bag immediately after taking out from the stove. Shred the cooked roots as it will be sticky and let it cool for a minute. Mix the shredded coconut and sugar along with this and Njoy !!! Glad to know you are feeling better dear.. This dish is very new to me..looks very simple n delicious! very tempting dish.. glad that u are feeling well..
Take care Shanavi, maravalli kizhangu puttu is one of my fav, i'll add few cardamom powder to them else i do the same too..
Hope u r doing good now ! the puttu looks simple & healthy ! New to me,looks absolutely delicious.